We have a great range of over 25 drinks from brands like NESCAFE GOLD BLEND, KENCO Smooth, PG Tips, GALAXY, KNORR and STARBURST, all from a KLIX machine that has had the "hassle" engineered out. Klix Coffee Machines are specifically designed with the office environment in mind. 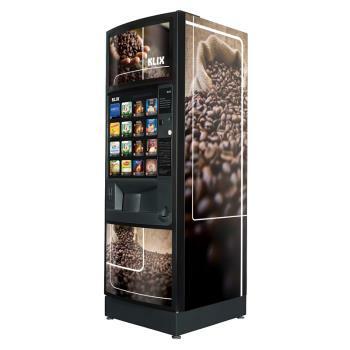 Widely renowned for their reliable and efficient technology and their huge variety of quality drinks, Klix Coffee Machines effortlessly boost morale through truly offering something for everyone. 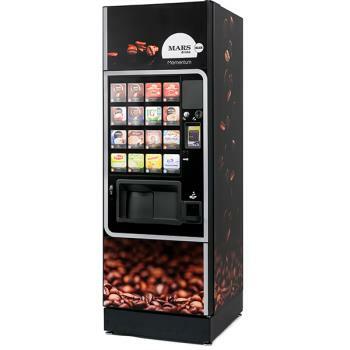 These high quality machines were developed by Mars Drinks, and as such are available with some of the most popular drinks brands in the UK/Ireland. Coffee lovers will be spoiled for choice with the range of Nescafe Gold Blend options. There’s even a range of café style options, including lattes and cappuccinos. Tea drinkers can choose between PG Tips and refreshing Lipton Lemon Tea, while chocoholics will love the truly indulgent offerings from Galaxy and Chocamento. For the sort of refreshment that is only possible with a cold drink is desired there’s crisp and clear BRITA water and a range of Starburst fruit drinks. There’s even a choice of delicious KNORR soups should your staff ever want anything more substantial. 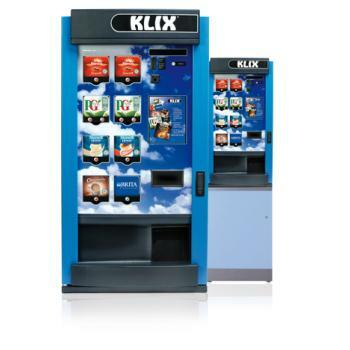 There are two Klix Coffee Machines in our range. The Klix Outlook is one of our flagship products and is without a doubt one of the best office vending machines money can buy. Designed to be ultra-low maintenance, it has a capacity of up to 1,375 cups which means that you will seldom have to restock it. It dispenses a wide range of drinks in large, eco-friendly, recyclable 9oz cups. As all drinks are prepared using BRITA filtered water, everything is guaranteed to taste fantastic and best of all, should you wish to give your staff a Friday treat or a reward for good work, it can be programmed to “free vend” for certain periods. The Klix 450 is the table top counterpart of the full-sized Outlook model. It’s ideally suited for staff canteens, smaller offices and workforces. Though obviously not as large as the Outlook, with its 400 cup capacity, it remains convenient and low-maintenance without compromising on quality. If you have any questions concerning our range of Klix Coffee Machines, or if you would like a quote for your business, call us on 028 90 826 562 (NI) or 1890 321 000 (ROI).